GWERU, Zimbabwe (CNN) -- Zimbabwe's new prime minister on Sunday called the country's economic situation "dire and serious" and asked the international community for help. 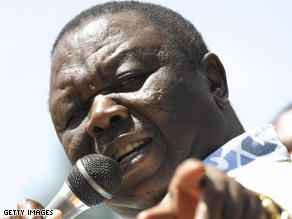 Zimbabwe PM Morgan Tsvangirai said that the country will have to get help from the international community. Prime Minister Morgan Tsvangirai said Zimbabwe will have to "borrow and beg" because it needs urgent attention. "Please, be in solidarity with the people of Zimbabwe," he said during a gathering marking the 10th anniversary of his Movement for Democratic Change party, held in Gweru, about 190 miles (300 kilometers) from Harare, the capital. "The situation in the country is so dire, ministries are in a very dilapidated state." Last week, Tsvangirai said the country's battered economy needed $5 billion. His appeal came soon after a U.N. humanitarian mission flew Saturday to the southern African nation for a five-day visit to assess a cholera epidemic that has killed 4,000 people, and an acute food shortage. About one week ago, Medecins Sans Frontieres, known in English as Doctors Without Borders, released a report saying that new cholera patients were being registered at a rate of one every minute at the beginning of February in Zimbabwe. Cholera is a preventable water-borne bacterial illness that causes severe diarrhea, vomiting and dehydration and can lead to death in a matter of days if not treated. Years of poor agricultural production, widespread corruption and failed government policies have damaged the nation, which has one of the world's highest inflation rates. Many civil servants -- including teachers, doctors and nurses -- have been on strike since September, demanding higher pay. That has caused many schools to close. Tsvangirai said he was committed to the inclusive government formed with President Robert Mugabe. Mugabe's Zanu-PF and the MDC struck a power sharing deal after a hotly disputed election in which Mugabe claimed victory. Opposition leaders and international observers questioned Mugabe's claims. Last week, a Zimbabwe court charged a senior opposition official over an alleged plot involving terrorism and insurgency. Tsvangirai said that Zimbabweans had opted to form the inclusive government because "it was the only way to resolve the country's crisis." To his party members, Tsvangirai described Mugabe as not "very difficult" and challenged those who disagreed to raise their concerns to him directly. "If you think so, ask me," he said. Tsvangirai added that the government is working on a plan that calls for the restoration of freedoms, stabilization of the economy, easing of the humanitarian crisis and increased focus on education.